I have Easy VHS to DVD 3 Plus installed and seem to be able to capture video from VHS tapes (via a plugged in VHS player). However, once the capture is done, I don't seem to be able to edit the video or export it. Unless I do not understand the program controls, I believe that once the capture is done, I should be able to play it within the application when on the "Record, Import, Edit" tab, right? The video is shown on the right-hand side of the screen (name of the video, with length and a small picture of one of the frames in the video) but the "preview" window on the left doesn't show anything. And trying to use the controls at the bottom (play, fast forward, rewind, etc.) doesn't do anything. And switching to full-screen mode within the preview area also doesn't do anything. Maybe I just don't know how to use the program for editing? 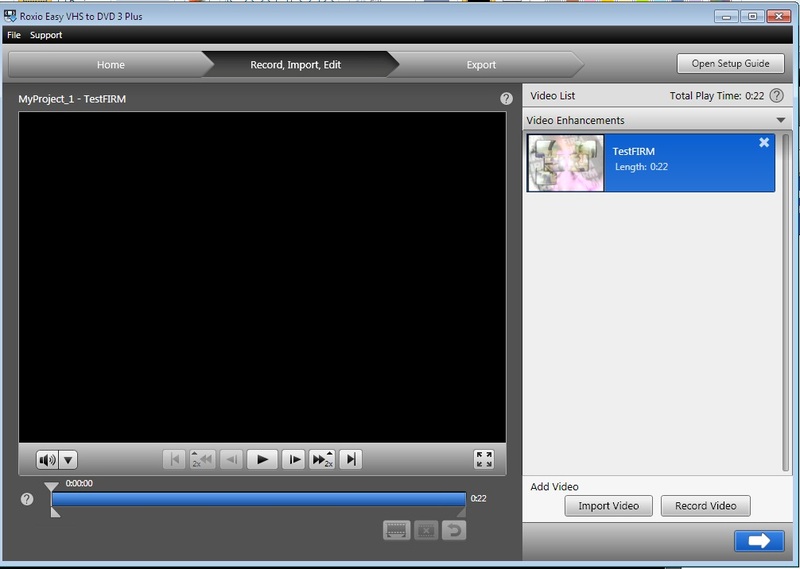 Also, when I try to export the captured video (ignoring the editing problems for the moment), that just fails. No matter which output format I select (for any of the possible device options), when I hit the "Export" button, I get a dialog box that says seems to indicate that the export is about to start, but it is immediately replaced with a dialog box that says "An unknown error has occurred. The application will shut down now.". Clicking OK on this dialog box just brings me back to the main application. I've tried just about all of the device options and all of the output formats (and quality settings) for each. Also, I can exit the program, browse to the directory where video captures are stored, and find the captured video in mpg format. Opening that with Windows Media Player works just fine -- the video plays, has audio, etc. So, I'm guessing some type of problem with the Easy VHS to DVD 3 Plus application? Or some issue with settings buried somewhere? Same for me , however despite recording full tape only records 1 hour 8 minutes, despite it still giving the impression its recording the full full length specified.Also will not export, gets to 99% and hangs! Dave; Thanks for the dxdiag information. You don't have a video card; just a video chip. ATI ES1000. I looked but could not find a driver for it. It Could be your problem. Contact Dell to see if there is an update for that chip. Blackmatrox. Do you have the exact same system? If not, start a new thread and provide the dxdiag information on your computer. Read and do this. I apologize that I took the hubby's word for it that we had a card instead of a chip. But my problem IS the same as OP. In what way do you think my prob. is diff. from the OP? 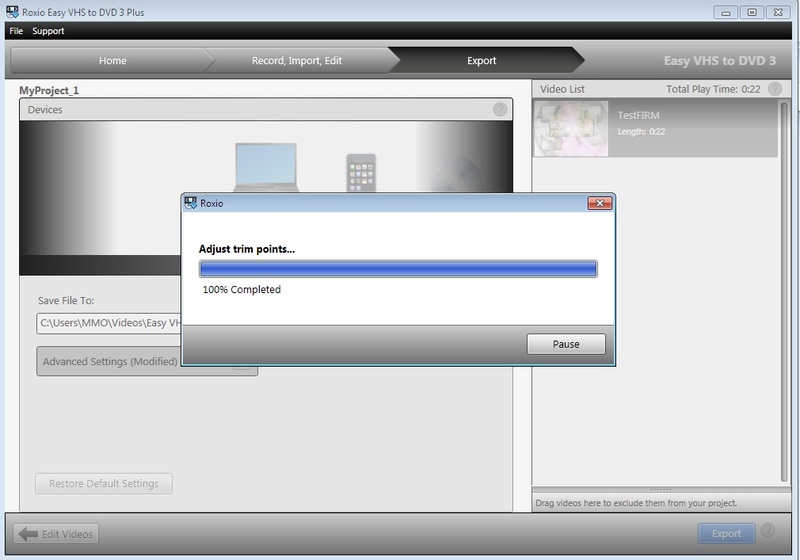 He mentions nothing about recording time and his problem is not about capture (he and I are able to "capture" it) but it just does not play back (for editing purposees) w/in the program AND we can not get it to export to anything and get that unhelpful error. Roxio2 - If you play around w/the buttons (I hit PLAY) all the buttons become active like you would expect (notice PLAY changed to PAUSE symbol), but still nothing on preview pane. Similarly, if you press the FORWARD to END button then the PLAY and forward buttons grey out just as though you ARE at the end, but still nothing plays, and the playhead does not advance. Roxio5 - Error message, again at least for me, even though it says it will shut down, it doesn't do that. 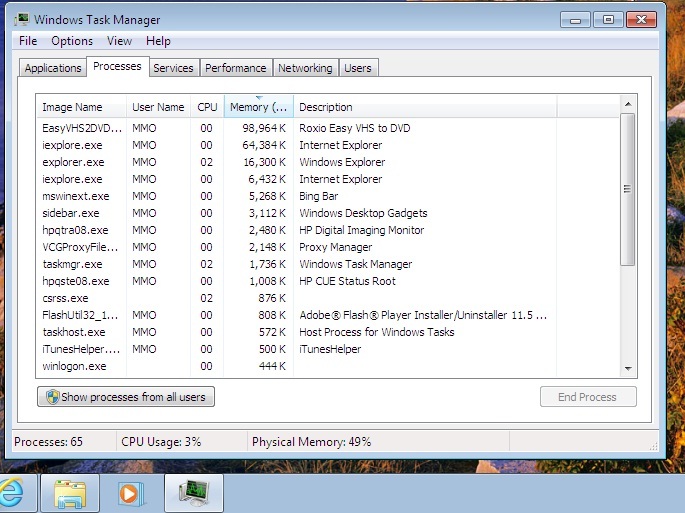 Roxio6 - My task manager, you can see it still shows Roxio even though it's not in my toolbar below (because I shut it down manually). Maybe the OP can confirm whether this is EXACTLY what he is seeing, but from what he described my problem was EXACTLY the same and I wish you hadn't assumed it wasn't. Very sorry - I am new to this and as I have exactly the same errors and could provide copies of exactly the same screen shots I thought it best to indicate that I have the same problem. I have always taken the approach that if a problem is a duplicate it is a waste of everyone's time to start a new thread that simply duplicates another thread. I didn't expect such a curt, if not rude slap in the face like that!!! I will now start a new thread which will have exactly the same screen shots and hope that is the correct forum etiquette on this board.